January 22, 2015 by iCepts Technology Group, Inc.
Get ready to grow your business and elevate to a robust, proven, and reliable Enterprise System from Microsoft. When your business begins to diversify and grow in complexity, you need more than basic bookkeeping, inventory management and backward looking reporting. You need efficiency and accuracy from your desk to the front desk. 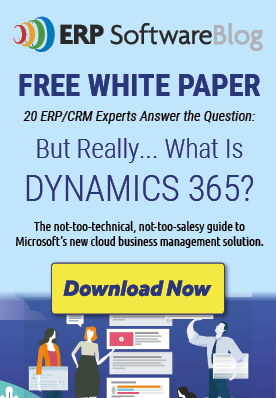 You need a complete business management system such as Microsoft Dynamics NAV 2015. You cannot scale operations to support business growth. A growing business typically requires more people, more productivity and more collaboration across all departments to keep up with demand. As you expand product lines and enter new markets, your business processes become more complex. With basic accounting software, even the simplest processes, like invoicing and month-end closing can take hours; even days to complete. In addition, if your business is stifled by the number of people who can access information, transaction limits, or the size of your database, it’s time to find a solution that can scale with your business to allow for growth. You can’t wrap your arms around your business anymore. The used to be a one-to-one correspondence between your employees and the business functions they managed. Now, data moves from desk to desk and you don’t have the controls in place to ensure a detailed and accurate audit trail. If multiple users can make changes to financial entries in entry-level accounting software, it’s difficult to trace who has done what. Protect yourself with a business management solution that supports and enforces well-defined roles and processes and give you tighter control over critical functions like payments, purchasing, and inventory management. Your business is reactive and needs to be proactive: Sure QuickBooks can give you a snapshot of your sales performance for the past quarter, but do you know which products produce the highest margins and which customers are likely to purchase the highest volume of those products? Instead of looking at reports of past performance, you need insight into current activities and developing trends to move your business forward. The right business management solution can give you full visibility into what drives your profitability and the ability to turn those profits into the cash flow what will support your future growth. You cannot meet customer expectations: Are you using QuickBooks to manage your finances and a whole different set of tools to administrate contracts, track customer interactions or manage delivery systems? If you don’t have the right system in place to track customer interactions and forecast demand, and those systems don’t talk to each other, you may find yourself unable to meet customer expectations. To compete in an increasingly completive global economy, you need a well-tuned supply chain and the ability to manage customer and vendor requirements.